Come and see us at our new location! 128 W. Palace Avenue 1 block off of the historic Santa Fe Plaza. 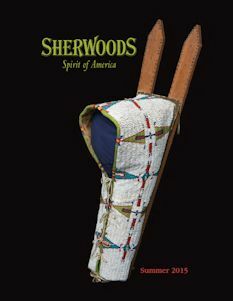 Welcome to Sherwoods Spirit of America. We are Santa Fe’s premier gallery specializing in Native American artifacts and historic Americana. We offer the finest examples available from every corner of America – from the Northwest Coast, Eastern Woodlands and Great Basin to the Great Plains. To be in the historic collectibles business, you must be a collector. Collecting is not based on a simple “buy and sell’ premise. Having some 50 years of experience in acquiring my personal and business collections, I consider myself to be somewhat of an authority on the items in which we deal. I have seen many changes over the years – not only in the area of pricing but also in the availability of fine collectibles. As an amasser myself, for the people new to collecting or advanced collectors, concerns are clearly understood. In order to further reassure our clients, we have Certificates of Authenticity available that support the representations we make about historic artifacts we offer.